The end of fragmentation as we know it? Android has come on leaps and bounds since its launch in 2008, but many users are using old or low powered phones which aren't compatible with more recent versions of the OS. In fact versions as old as Gingerbread are still relatively common. Android 4.4 KitKat aims to change that according to a new leak from JessicaLessin.com. 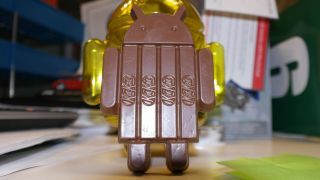 The leak states that Android KitKat "optimises memory use in every major component" and makes it easier to develop memory efficient applications for entry level devices right down to those with just 512MB of RAM. So if you're stuck on a phone running Android Gingerbread there may be hope for an update. If this rumour bears fruit it could also revitalise sales of ageing handsets and make lower end Android phones a more attractive proposition as they might be in for an upgrade. Android KitKat also appears to be built with wearables in mind, as the same source states that KitKat will support three new types of sensors, specifically a step detector, a step counter and a geomagnetic rotation vector. The most obvious use for them would be in Google's rumoured smartwatch, but they could also benefit other smartwatches and Google Glass, while even phones could potentially utilise them, as fitness apps such as pedometers would surely be able to make great use of a step counter. The source further suggests that these sensors might also be used to help Google map out indoor locations and improve walking directions. With Android KitKat likely to be unveiled very soon it wont be long until we know just how true all this is. Have a break, have some more KitKat rumours.